We sincerely love connecting + supporting our community both inside and outside of Polygon Market, and when Derek + I got married, we had the pleasure of hiring our clients, friends, and creative partners to help make our wedding day special. Witnessing everyone so effortlessly thrive in their passions is truly inspiring, and it has sparked an overwhelming abundance of energy + courage for us to confidently tackle our next endeavor as business partners. We could not have done this without you - our cherished network. WE'D LIKE TO EXPRESS OUR EXTREME GRATITUDE TO EVERYONE WHO HELPED CREATE SUCH A MEMORABLE EXPERIENCE. TAKE A CLOSER LOOK AT THE BEAUTIFUL DETAILS BELOW:(photography: ENCARNACION PHOTOGRAPHY). Encarnacion Photography captured our first performance warm up at Mac House Production Studios. Beautiful arrangement by Special Occasion Flowers by Judy. Click photo for more! Arrangement by Special Occasion Flowers by Judy. Click photo for more! Collaborative effort between Polygon Market + Jenn Matilla Lifestylist to determine the bridal party style. Click photo for Jenn's portolio! Mac House Productions was transformed into an industrial chic wedding. Click for more about Mac House! Beautiful capture of our first performance warm up by Encarnacion Photography. Click photo for more on Encarnacion! Beautiful arrangement by Special Occasion Flowers by Judy. Click for more! Silicon + Sea really helped make our dreams come true. Click more for Silicon + Sea wedding coordinating! Hats off to The Pastaria & Market for creating the cocktail hour of our dreams! Click photo to make a reservation at The Pastaria! The nachos paired so well with ice cold Hapa's Brews! Click photo for more on Hapa's Brewing Company! 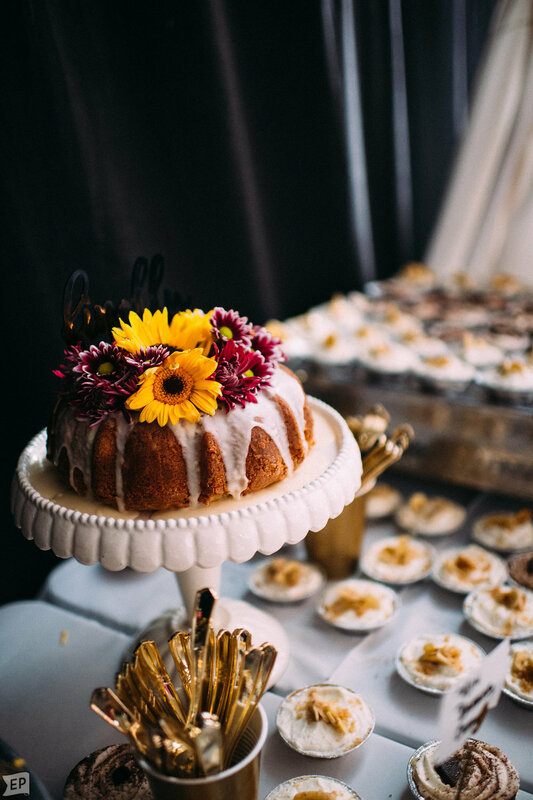 Hats off to The Pastaria & Market for creating the dessert table of our dreams! Click photo to make a reservation at The Pastaria! The Pastaria & Market replicated Grandma's old 7Up cake recipe for our wedding cake. Home is where the heart is... Click photo to make a reservation at The Pastaria! The Pastaria & Market went above and beyond to make our dreams come true! Click for more about The Pastaria! We love the owners at The Pastaria & Market! Click for more! Huge thanks to Encarnacion Photography for highlighting the most memorable moments! HATS OFF TO THIS AMAZING COLLECTION OF CREATIVES!